I take a lot of pictures of light fixtures. 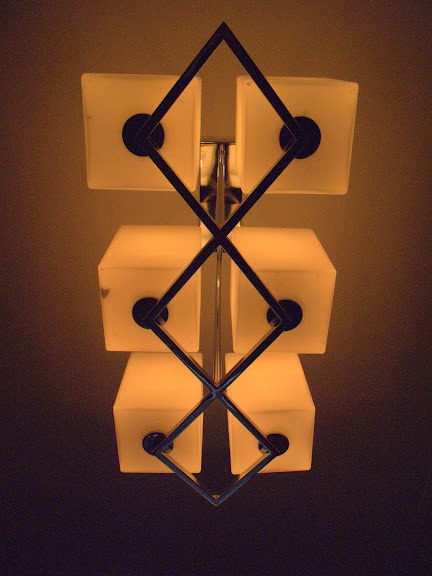 Something about the way the light and geometry of the fixture work together. This one was at a Homearama 2009 house we visited this past October in Culpepper Landing, Chesapeake Virginia. Even though it was a brand new house, the fixture already has a dead fly. Canon G10, 1/2000 sec @ f/3.2, ISO 400.
ugh on the dead fly. The light fixture has nice lines. Guess I should have "Photoshopped" that fly right out of the picture.